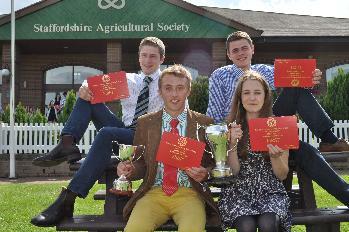 Shropshire Federation of Young Farmers’ Clubs (FYFC) took home the biggest haul of trophies from Competitions Day following first place positions in Junior Speaking and Just a Minute. The County picked up two awards for their performance in Just a Minute with not only the team trophy but also individual recognition for Claud Baker who was named Best Team Member. The four team members from Brown Clee YFC - Claud, Sam and Joe Williams and Nancy Rollings - said it was all about tactics in the fun competition that requires you to talk for a minute without hesitation, repetition or deviation from the topic. The competition emulates the popular show on BBC Radio 4 and the team said they used comedian Paul Merton as an example to follow. “Barcelona gave us the edge as we use it in all of our topics,” explained Nancy about the team’s tactics which included using positives and negatives for different genders. The judges did pick up on the Barcelona tactic and stopped them from using it eventually. Glamorgan were not too far behind in the trophy count – with first place positions in Situations Vacant and Debating. 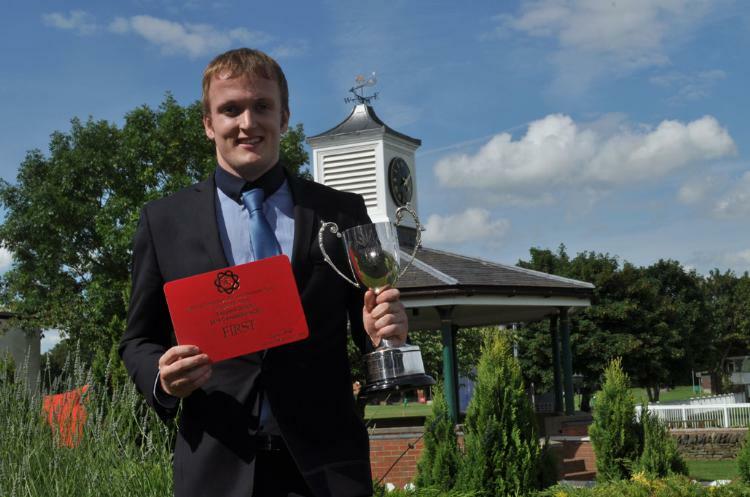 Carwyn Roberts, aged 22, entered the Situations Vacant competition and had to apply for a fictitious job as a Mechanical Engineer with HOPS – NFYFC’s commercial trading arm. The HOPS team put the job profiles together for the competition and took part in the judging. In Junior Reading, Pembrokeshire won for giving the best reading from David Walliams’ book Gangster Granny. 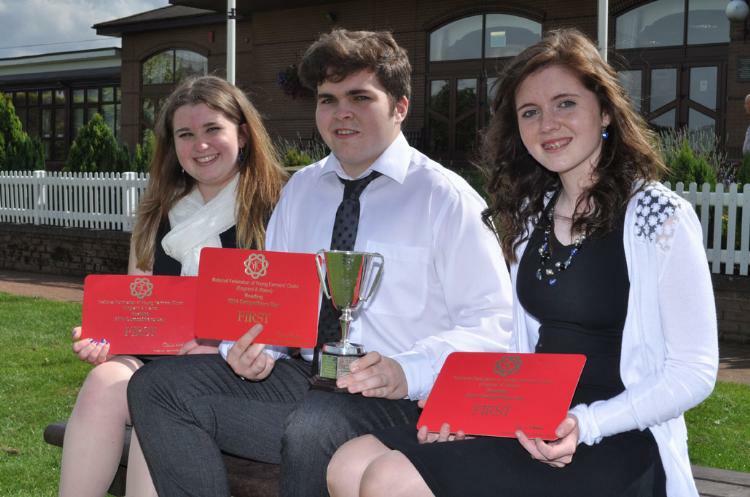 Nia Lloyd and Tomos Evans from Fishguard YFC and Ffion Phillps from Hermon YFC joined forces to represent Pembrokeshire – even though they had initial reservations over the book choice. The trio fought off stiff competition from other counties with Cumbria A in third place and Brecknock taking second. But it’s their close friendship that Pembrokeshire think helped them to win. “We all have different strengths. Tomos is the Drama King and likes the more dramatic pieces, Nia has the more subtle quiet pieces and I’m more emotional and use accents,” said Ffion. “We’re all best friends so we know each other really well. In other public speaking awards, the Best Chairman in Junior Speaking was won by Sophie Taylor from Wiltshire FYFC and the Best Speaker in Debating was Kirsty Reed from Devon. 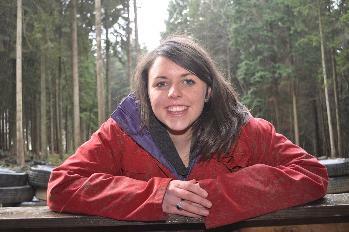 A passionate speech about her commitment to YFC impressed the judges and made Sophie Winzer from Exmoor YFC in Somerset the 2014 Junior Member of the Year. Sophie was chosen from six other finalists – but all seven will now join the Youth Forum Steering Group which helps to inform the Federation of the views and ideas of younger members. The finalists were all required to do a PowerPoint presentation between three and 13 minutes long and then were interviewed about YFC and how they would encourage new members and what new competitions they would like to introduce. Sophie, who has recently turned 18 years old, talked about her work with Young Farmers, including her overseas experience with a farming charity in Uganda as well as an impending trip to Perth. “There are so many things you can get out of YFC. You become more confident and you meet so many new people. It’s a way of life for me,” said Sophie. An active member of her club in Exmoor, Sophie was delighted to be chosen as the winner and says more people should give it a go as she never expected to win. 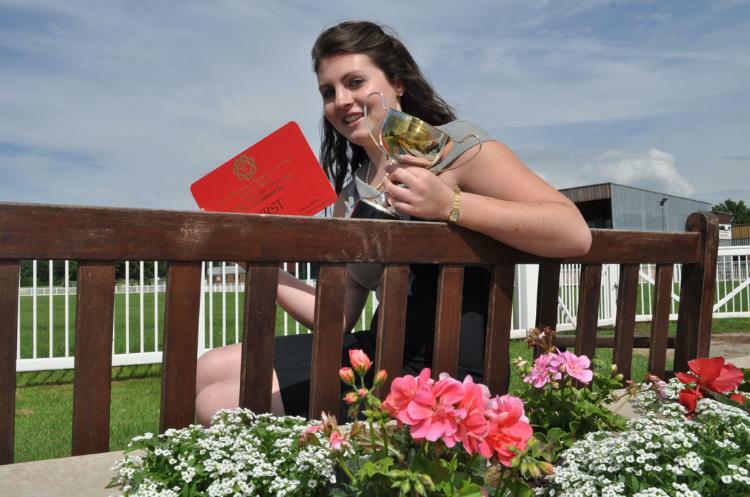 Sophie has been a member since 2010, and has just left college and is about to have a gap year before starting Harper Adams in 2015 to study Agriculture and Crop Management. She was hoping to celebrate her victory with her Club later at the Polden Hills’ Summer Sizzler. 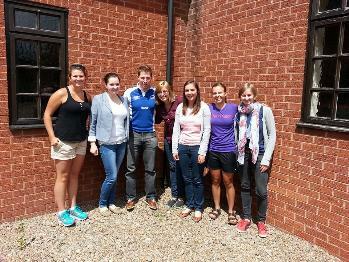 NFYFC welcomed six exchangees to England in June to be hosted by clubs and counties across England and Wales. The visitors will spend time learning about life as a Young Farmer in the UK and for clubs hosting an exchangee it’s also a great way for members to learn about new cultures. Gunvor Guttormsen from Norway is spending a week with clubs in County Durham and Caroline Baker from Stockton YFC said it was a great opportunity for members. (Gunvor is pictured left with Caroline right). While Caroline has had to work during the week days, members from the County have rallied round to help entertain Gunvor – including a tour of Raby Castle. 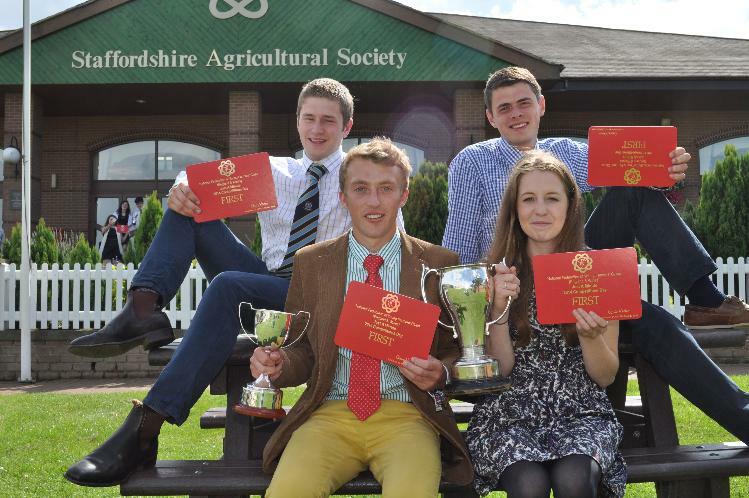 NFYFC will host 10 exchangees in total this year – with three more due to arrive in the UK in July. The YFC Travel programme is shaped by the Personal Development (PD) Steering Group and at the June Council meeting it was agreed that next year’s trips would remain the same as 2014. The only exception being the group travel trip, which next year will be to India. Members on the PD group also help guide the Federation’s training plans and new proposals are underway for a new training programme. The group are also contributing to the YFC Buzz each month with tips and advice for Club chairmen. 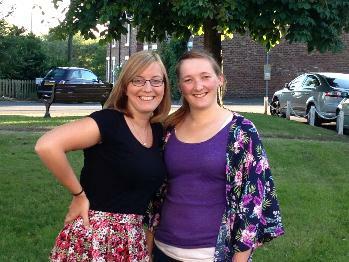 Find out more about YFC Travel opportunities. 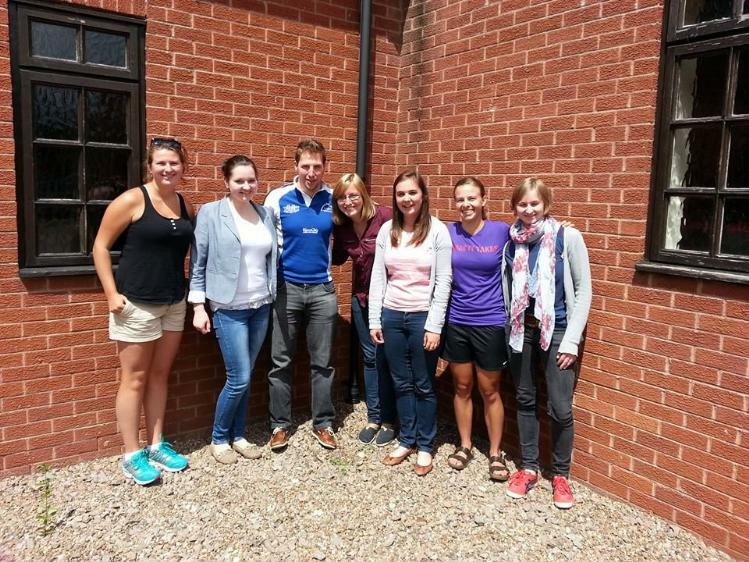 The Agriculture and Rural Issues (AGRI) Steering Group (#yfcagri) is ramping up the promotion of the group’s activities through a new newsletter and a Facebook group. Members of AGRI gathered in June ahead of the Council meeting and agreed to do more to involve County AGRI links people. The newsletter has been circulated to members and features updates on CEJA among other actions. An invitation to attend the Steering Group meetings in an observer capacity will also be offered to County AGRI links people who want to find out more. 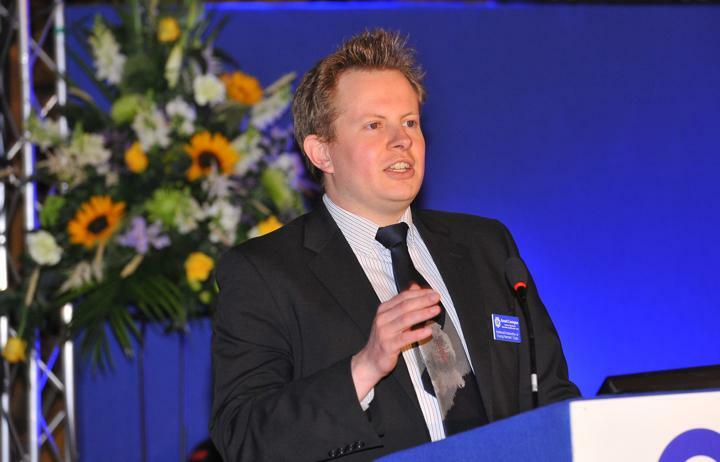 During the meeting James Hutchinson from Wiltshire was elected as the new NFU representative and he will be deputised by Paul Hartley from Norfolk. This year’s AGRI Forum that was held during Annual Convention, was the subject of much discussion and the Convention survey feedback is helping to shape future AGRI events. 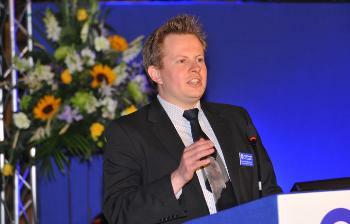 For more information about #yfcagri, email the AGRI Officer Jo Wyles or call 02476 857200. Find out more about the June Council meeting in the summary report. The Youth Forum is submitting a motion to the British Youth Council to raise awareness of mental health issues in rurally isolated areas. The motion, which is being raised in support of NFYFC’s Rural+ campaign, is one of two the Forum will submit. The other motion focuses on increasing field to fork education in schools. The Forum wish to propse that it is mandatory that all primary schoolchildren have a farm visit, supported by learning resources to raise awareness of where food comes from. The motion backs up other work the Youth Forum are working on with FACE and their efforts to create a new Field to Fork game for schoolchildren. The group are showcasing a pilot game at the CLA Game Fair in July called Watch that Cowpat! Children (and adults) have to match produce, such as milk, to a picture of what has produced it, such as a dairy cow, on a large mat. The Youth Forum, who are now one of the organisation’s five Steering Groups, are focused on coming up with ideas to involve members aged under-19 in the Federation. Council approved their idea to progress an under-18 ski trip in February 2016 as part of the YFC Travel programme. Sioned Davies, Chairman of the Youth Forum (pictured), presented the updates from the Steering Group meeting to the Council and mentioned the success of the Time Capsule burial in April to commemorate the 80th year. Members of the Youth Forum also visited all the Steering Group meetings on the Saturday before Council to ensure younger members views were heard. A stylish addition to the competitions programme in 2014-15 will add a touch of glamour to Competitions Day 2015 when members will showcase homemade garments at a YFC fashion show. Members on the Competitions Steering Group at Council agreed to change the ‘bunting’ competition to a challenge for members to create a garment that will be worn and judged at Competitions Day. Double eliminator entries for painted canvas, fashion and garden sculpture. Members competing under 18 years old must now submit Parental consent forms to NFYFC TEN working days before a national final (instead of five). After a lengthy discussion around a proposed increase in fines for those who withdraw from competitions after the deadline, it was finally agreed that Council members should discuss this suggestion with their clubs and bring thoughts back to the November Council meeting. Other competition news included the fact Cube Exhibits are now being displayed at the Tenbury Show, Worcestershire on 2 August alongside the finals of the Tug of War. This was because the show attracts more members of the public than the Competitions Day and gives members’ artwork the profile they deserve. The Competitions Steering Group is also looking at the rules for future Tug of War competitions and NODA will be approached about judging the Pantomime competition at Convention 2015. Positive feedback in the Convention survey about the Darts competition at this year’s Annual Convention means that it will be staged again in 2015 at the Convention in Torquay. Find out more about the Council meeting in the summary report.